My Journey at the Nuclear Brink, by William J. Perry, with a foreword by George P. Shultz, Stanford Security Studies, 234 pp. Perry does not use his memoir to score points or settle grudges. He does not sensationalize. But, as a defense insider and keeper of nuclear secrets, he is clearly calling American leaders to account for what he believes are very bad decisions, such as the precipitous expansion of NATO, right up to the Russian border,(2) and President George W. Bush’s withdrawal from the Anti-Ballistic Missile Treaty, originally signed by President Nixon. In his foreword to the book, George P. Shultz describes Perry as a man of “absolute integrity.” His record is remarkable: Ph.D. in mathematics, vast technical training and experience in high-tech business, management of research and weapons acquisition as an undersecretary of defense under President Carter, and deputy secretary and then secretary of defense under Bill Clinton. Perry writes that he started young, at the age of twenty-six in 1954, as a senior scientist at Sylvania’s Electronic Defense Laboratories in what is now called Silicon Valley. Today we think of this part of the world as the home of Apple, Google, and Facebook, but back then the principal work was defense, the business of mass destruction. Within ten short years after the end of World War II, both the Soviet Union and the United States had developed hydrogen bombs, which increased by a million times the destructive capability of the conventional bombs that had been available during World War II. Children were taught to “duck and cover” under their desks and public buildings prominently displayed signs showing where to take shelter in case of nuclear attack. Perry’s first job at the Electronic Defense Laboratories was “to evaluate a proposed electronic countermeasure system” intended to jam “the guidance signal of an attacking Soviet intercontinental ballistic missile (ICBM).” After careful study, he reported that jamming could successfully reduce fatalities from a medium-size nuclear attack by about two thirds, that is, from 75 million immediate deaths to 25 million. But he later noted that this estimate did not take into account long-term deaths from radiation and “nuclear winter.” Nor did it include the tens of millions of wounded who couldn’t be treated or the total disruption of the economy and the fabric of our society. This was the moment when Perry concluded that there could be no acceptable defense against a mass nuclear attack, an opinion from which he has never deviated. Many political leaders, including several presidents, have disagreed with Perry and have sponsored various types of anti-missile defense systems, the latest being the ballistic missile defense system now being installed in Eastern Europe. Perry recalls that it was the fear of nuclear annihilation during the cold war that unleashed the billions of federal dollars that supported the secret defense work that began in Silicon Valley and then propelled it forward. As much as anyone, Perry is aware of the ways, secret and public, that technical innovation, private profit and tax dollars, civilian gadgetry and weapons of mass destruction, satellite technology, computers, and ever-expanding surveillance are interconnected. But he now uses this dark knowledge in an effort to reverse the deadly arms race in which he had such a pivotal role. Perry was there at the beginning, as part of the elite and highly classified Telemetry and Beacon Analysis Committee, set up by the CIA and the National Security Agency to assess Soviet ICBMs. He was also on the team that analyzed the photographic images that our U-2 spy planes began collecting in 1956, until the program ended four years later when the Soviets shot down the plane piloted by Gary Powers. He was also part of the team assembled in 1959 by Allen Dulles, the director of the CIA, to determine whether or not there was a “missile gap” with the Soviet Union. In fact, there was no gap but the report Perry worked on was kept secret for decades, as he reveals in his book. Then, during the height of the Cuban missile crisis, Perry was chosen to be a part of the small group of analysts who worked day and night gathering information about the Soviet missiles being deployed on the island. They examined photographic and other data and prepared a written report that was delivered to President Kennedy each morning. Perry says it was by luck that we avoided a nuclear holocaust in the Cuban crisis. Years later, we found out that there were some additional and dangerous circumstances that might have pushed us into nuclear war. Second, during the crisis, an American reconnaissance plane stationed in Europe wandered off course and flew into Soviet airspace. The Soviets immediately scrambled attack aircraft as did American fighters from an airbase in Alaska. The Americans were armed with nuclear-tipped missiles. Fortunately, the American reconnaissance pilot discovered he had blundered into Soviet airspace and flew away before any Soviet intercepts arrived. At about the same time an American ICBM was launched from Vandenberg Air Base. Though this was a routine launch intended as a test, it could have easily been misinterpreted by the Soviets. Luckily, it wasn’t. Tragically, despite coming so close to nuclear annihilation, the leaders of the Soviet Union and the United States did not make any effort to slow nuclear competition; they did just the opposite. Perry sees here the operation of “surreal…thinking” utterly at odds with the new reality of nuclear weapons. Yes, the hotline between Washington and Moscow was established, but otherwise strategic thinking in both the US and the Soviet Union went on as though nothing had happened. As a result, an even more sophisticated competition began, in nuclear warheads and in the vehicles to deliver them. Dean Rusk, the US secretary of state at the time, triumphantly declared that “we’re eyeball to eyeball, and I think the other fellow just blinked.”(4) If that was meant to imply that America had won, he was wrong. The Soviets just stepped up their nuclear efforts and so did the US, each building thousands of dangerous nuclear devices that if ever used could obliterate large swaths of humanity. 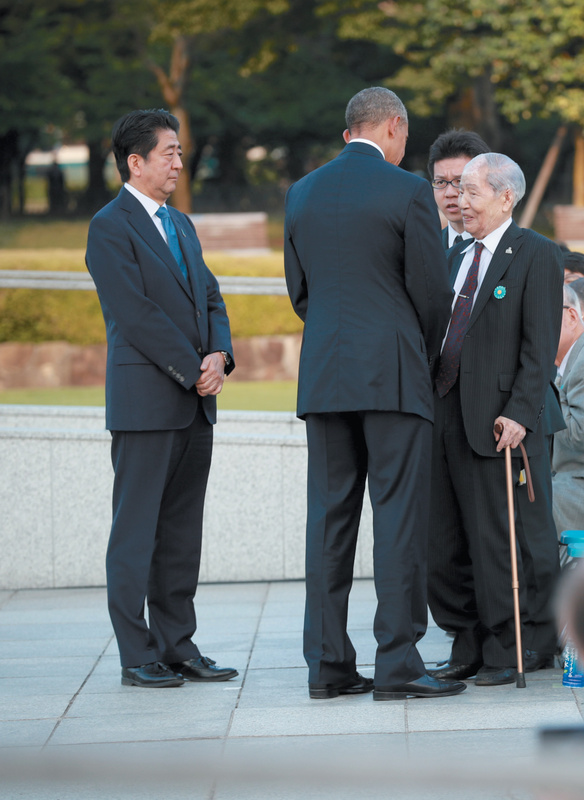 Doug Mills/The New York Times/Redux – President Obama with Sunao Tsuboi, a survivor of the US’s atomic bombing of Hiroshima in 1945, during a ceremony at the Hiroshima Peace Memorial, May 2016. Japanese Prime Minister Shinzo Abe is at left. Perry candidly recognizes that the nuclear threat also meant very good business for defense laboratories such as his own employer, Sylvania. His work there focused on understanding the Soviet missile and space systems and he found the challenges of this high-tech spying exhilarating and highly profitable. His mission was gathering cold war intelligence by technical means. But Sylvania had a problem. It was a world leader in manufacturing vacuum tubes at a time when the new solid-state technology was emerging. But Perry saw clearly that Sylvania’s analog technology would soon be replaced by digital technology based on Intel’s new solid-state devices, together with new small, high-speed computers then on the drawing boards of companies like Hewlett Packard. He decided it was time to strike out on his own and with four partners founded ESL, Inc. The work of the new company would be top secret and it could not disclose either its products or customers. Nevertheless, during the next thirteen years, ESL, by winning one government contract after another, grew to over a thousand employees. Historically, the interpretation of intelligence had been exclusively reserved to government agencies, but several of the most critical targets of intelligence had become highly technical. They included ICBMs, nuclear bombs, ballistic missile defense systems, and supersonic aircraft. To collect data on these sophisticated weapons systems, Perry explains, required technical reconnaissance equally as complex. The federal government began to contract with private companies possessing the requisite knowledge and skills, and ESL was in the vanguard. Under Perry’s leadership, his company won long-term contracts for analyzing telemetry and beacon and radar data, and became indispensable to the national effort to understand the nature and extent of the Soviet threat. The next step for Perry came with the election of Jimmy Carter in 1976, when the new secretary of defense asked Perry to become undersecretary of defense for research and engineering. For the next four years, Perry threw himself into this work and, drawing upon all that he had learned, directed America’s major step toward improving competence on the battlefield. The strategy had three elements: (1) intelligent sensors to locate all enemy forces in real time; (2) smart weapons that could strike targets with great precision; and (3) stealth systems that could evade enemy radar. The great paradox of the nuclear age is that deterrence of nuclear war is sought by building ever more lethal and precise weapons. In Perry’s case, that was his mission and he carried it out with imagination and extraordinary skill. The problem he faced was that the Soviet army was seen to have a three-to-one edge in conventional forces, leaving America only with its nuclear forces to deter the Soviets from advancing into Europe. The answer, concocted by both public and private experts, was to create a “radically novel and highly sophisticated offset strategy.” Through technology, America would offset the Soviet military superiority on the battlefield. The results included the F-117 and B-2 stealth bombers, smart artillery shells, short- and long-range cruise missiles, and reconnaissance aircraft. Success unfortunately can lead to overconfidence and I wonder whether the success of the first Gulf War lulled George W. Bush into thinking that another war could be fought with similar results. We now know that technical prowess can’t necessarily overcome the human factors of ethnic division, historical enmity, and religious belief. Although he didn’t believe that nuclear deterrence required that we match our adversary weapon for weapon, he acceded to the political pressure to keep up with the other guy. Then as now, Perry writes, he believed that America would possess all the deterrence it needs with just one leg of the so-called triad: the Trident submarine. It is very difficult for armies to track and destroy it, and it contains more than enough firepower to act as a deterrent. The bombers provide only an insurance policy for the unlikely contingency of a temporary problem with the Trident force, and also have a dual role in strengthening our conventional forces. Our ICBM force is in his mind redundant. Indeed the danger of starting an accidental nuclear war as a result of a false alarm outweighs its deterrent value. Through his first period at the Defense Department under President Carter, Perry showed great confidence in the power of high technology to offset enemy forces and protect American security. But in 1994, when he became President Bill Clinton’s secretary of defense, the US faced an entirely different set of security problems. The cold war was over, and the nuclear weapons of the former Soviet Union were located not only in Russia, but also in three new republics that were not capable of protecting them. Perry gave these “loose nukes” his highest priority. He was able to arrange for the dismantling of all of the thousands of nuclear weapons in the Ukraine, Belarus, and Kazakhstan. He movingly tells of visiting a silo built for the Soviet SS-19 missile and watching it disintegrate in a cloud of smoke. Earlier he had visited the site and was briefed by young Russian officers on how the hundreds of missiles under their control would have been fired at targets in the United States. Observing a practice countdown at a site that at that very moment was targeted by American missiles, he realized what an absurdity had been created by nuclear competition. There followed heady days, under SALT II, when thousands of missiles and warheads were destroyed and huge quantities of chemical weapons eliminated in both Russia and the United States. Loose nuclear material was secured and Russian nuclear scientists were actually given nonmilitary work at a technical institute established in Moscow. This was all made possible through a program (that is now discontinued) sponsored by two senators, Sam Nunn and Richard Lugar, for which Congress provided substantial funding. In retrospect, Perry sees this destruction of weapons and sustained cooperation between Russia and the United States as a minor miracle. Both countries even cooperated militarily during the war in Bosnia between 1992 and 1995. That year, 1996, turned out to be the high point in Russian–American relations. The NATO expansion began during President Clinton’s second term. After President George W. Bush was elected, NATO was expanded further to include more nations, reaching all the way to the Russian border. Bush also withdrew the United States from the Anti-Ballistic Missile (ABM) Treaty, and started deploying an ABM system in Eastern Europe, thereby repudiating the important achievements of Richard Nixon and fostering the illusion that a defense could successfully defeat a determined attack of nuclear missiles. My Journey at the Nuclear Brink is a rare accounting of the last six decades of American policy in the new age of nuclear danger. Perry makes it clear that the danger of nuclear terrorism is great and that even Washington, D.C., is not safe from attack. In fact, he lays out a plausible scenario of how terrorists could fashion an improvised nuclear device and blow up the White House and Capitol Hill, killing more than 80,000 people and totally disrupting our society. Perry also warns that a regional nuclear war between India and Pakistan could occur—with devastating global impacts. And, just this month, as the US broke ground on a future missile defense site in Poland and formally activated a missile defense site in Romania, Putin warned: “Now after the placement of these missile defense elements, we have to think how to neutralize the threats for the security of the Russian Federation…”(11) (emphasis added).